A-B-A-B-A : from here to hear is an experiment with rhythms of poetry, soundings, in-voicing, performing, rehearsing, translating and playing together. It is the third experimental get-together of poets, musicians and translators based in Addis Ababa and in Berlin, who join in this exercise of styles. Spoken poetry has a long history in Ethiopia, with Poetic Jazz being one of its contemporary expressions. Poetic Jazz crosses genetic material from music and poetry in a way that discovers a style and form based in listening. Rhythms, styles, and modes of playing are created between the musicians and the poets and reflect the specific quality of the poems being performed. Contemporary expressions of this tradition are tested in an artistic dialogue by Gashaw Abateneh (musician, Addis Ababa), Mihret Kebede (poet, Addis Abeba), Erica Licht (poet, Addis Ababa), Robert Lippok (musician, Berlin), Bekele Mekonnen (poet, Addis Ababa), Nebiy Mekonnen (poet/translator, Addis Ababa), Abebaw Melaku (poet, Addis Abeba), Rike Scheffler (poet, Berlin), Misrak Terefe (poet, Addis Abeba), and Moseb Traditional Music Band (Addis Ababa). 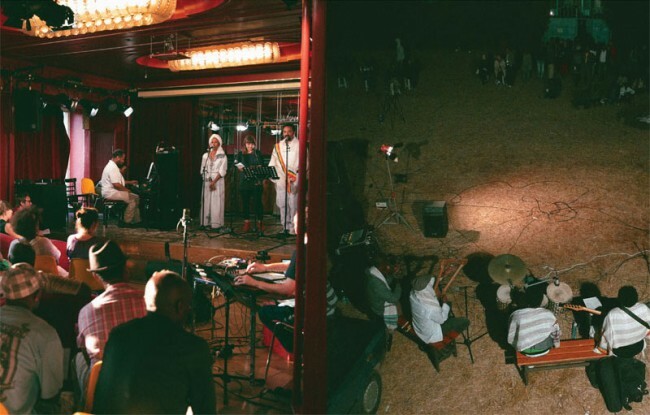 On the occasion a new album is launched, featuring recordings of the latest experimental live performances which took place in Berlin in July 2014. Spanning Amharic, English and German, the album A-B-A-B-A : from hear to here includes poems, performances, translations and sounds by Eric Ellingsen (poet/writer, Berlin/US), Mihret Kebede (poet, Addis Abeba), Robert Lippok (musician, Berlin), Abebaw Melaku (poet, Addis Abeba), Jorga Mesfin (musician, Addis Abeba), Rike Scheffler (poet, Berlin), Misrak Terefe (poet, Addis Abeba), Uljana Wolf (poet, Berlin). The release is accompanied by a documentary and short film by artist and film maker Clara Jo (Berlin/US). Gashaw Abateneh is a renowned musician and performer, known for his patriotic recitals and performances of Ethiopian battle songs in traditional acting style. He regularly stars at the Ethiopian National Theatre. Mihret Kebede is an artist, poet, and the founding director of the Netsa Art Village artist collective in Addis Ababa. Renowned for her poetry readings and experimental artworks, Kebede is also a founding member of Tobiya Poetic Jazz Group and is featured on the Tobiya poetic jazz DVD, Vol.1. Erica Licht focuses her research and work on creating bridges between community members and stakeholders, through dialogue and holistic environmentally conscious curriculum. Her practice has spanned leadership development, radio production, and anti-violence programs, including sites of the African Diaspora and Sub-Saharan Africa, with long-term posts in Trinidad, Jamaica, Uganda, Nigeria, Ethiopia, and the United States. Erica holds a B.A. in Africana Studies and Geography from Vassar College, where she was the recipient of the Paul Robeson Prize for the best senior thesis in the Department of Africana Studies, and the Frederic C. Wood Prize for excellence in morals and ethics. Robert Lippok is a musician and artist based in Berlin. He is a cofounder of the music groups Ornament und Verbrechen and To Rococo Rot. Recent works include ηχώ at the Festival of Future Nows, Neue Nationalgalerie Berlin (2014); the album Instrument with To Rococo Rot (City Slang, 2014); Daylightastronomy, music performance, Mutek, Montreal, Canada (2014); 24h Dahlem, music for a video installation by Clara Jo (2012–14); The Persistence of Memory, music performance with Nino Errera, Ethnologisches Museum, Berlin (2014); and Betón Brut, with Ronald Lippok, music for an exhibition by Arno Brandlhuber, NBK, Berlin (2014). Abebaw Melaku is a poet and journalist. He is a founding member of Tobiya Poetic Jazz Group and a radio journalist affiliated with the Ethiopian radio show ‘Addis Zema’. He published a volume of poetry called Keradion in 2007 and an audio poetry CD in 2008. The Moseb Traditional Music Band was established in 2013 with musicians playing basic traditional music instruments like base and lead kirar, drum, flute and masinko. They have been performing at different stages, cultural institutes, theatres, and jazz clubs, and have also collaborated with other established musicians in the country on various occasions. The band includes members: Tewodros Alemu (Saxophone), Solomon Betre Mariyam (Trumphet), Biniam Dagnachew (Lead kirar), Abu Gebre (Flute), Yigerem Gulilat (Bass kirar), Dawit Lisanu (Masinko), Robel Solomon (Drums). Bekele Mekonnen is a visual artist, poet, and educator. He has had numerous critically acclaimed exhibitions in Ethiopia, Europe and the USA, and has been awarded a number of residencies, fellowships, and awards both at home and abroad, including the Chicago Artists International Program, the Scholar Rescue Fund, and at the Maryland Institute College of Art in Baltimore, Maryland, USA. Bekele earned a Masters degree in Fine Arts from Moscow State Institute of Fine Arts in 1993. He served two terms (2000-2004 and 2009-2011) as the director of Ale School of Fine Arts and Design in Addis Ababa, where he is currently teaching as an Assistant Professor. From 2008-2010 he was director of the Modern Art Museum / Gebre Kristos Desta Center in Addis Ababa. Rike Scheffler, based in Berlin, creates work at the intersection of poetry and music. She has published work in many journals and anthologies, and has set them in song, text, and tone collages for the stage. She studied creative writing at the Deutschen Literaturinstitut in Leipzig and psychology at the Freie Universität in Berlin. Her poetry collection der rest ist resonanz appeared in the fall of 2014 from kookbooks Verlag. Rike Scheffler was a finalist at the 20th Open Mike and a grant recipient of the Stiftung Brandenburger Tor in Copenhagen. She helped found the poetry collective G13, a group of writers who bring together poetry with experimental stage productions and regularly organise open writing workshops in Berlin in an effort to encourage solidarity and a critical exchange among authors. She enjoys challenging common perceptions through small words and sounds and creating spaces through language. Misrak Terefe is an Ethiopian poet and the first female poet to publish a poetry VCD. She has contributed to different group publications with other writers and is featured on the Tobiya poetic jazz DVD, Vol.1. She is also a founding member of Tobiya Poetic Jazz Group, having been involved with the organization since 2008. Nebiy Mekonnen is a renowned poet, journalist, playwright and translator who has published poetry books and various essays. Nebiy is best known for “Negem lela ken new”, a translation into Amharic of the novel “Gone with the Wind”, which he wrote on 3000 cigarette paper pieces while in prison for a decade during the Derge Regime. He is also editor-in-chief of the popular weekly newspaper Addis Admass. Christina Werner is a curator and educator based in Berlin. She is co-director of the Institut für Raumexperimente and co-initiator and coordinator of the project Acting Archives–Media Lab for Artistic Research and Education developing collaboration and education formats between artists and educators based in Addis Ababa and Berlin on the subject of artistic translation and proactive archiving. This event is part of Acting Archives, a project by the Institut für Raumexperimente, Berlin University of the Arts and the Alle School of Fine Arts and Design, Addis Ababa University, supported by Studio Olafur Eliasson, and funded by the TURN Fund of the German Federal Cultural Foundation. It is choreographed by Mihret Kebede and Christina Werner and hosted by the Alliance Ethio-Française d’Addis-Abeba.